Stadion Wiener Neustadt also known to fans as the Magna Arena is a stadium located in the East Austrian city of Wiener Neustadt. 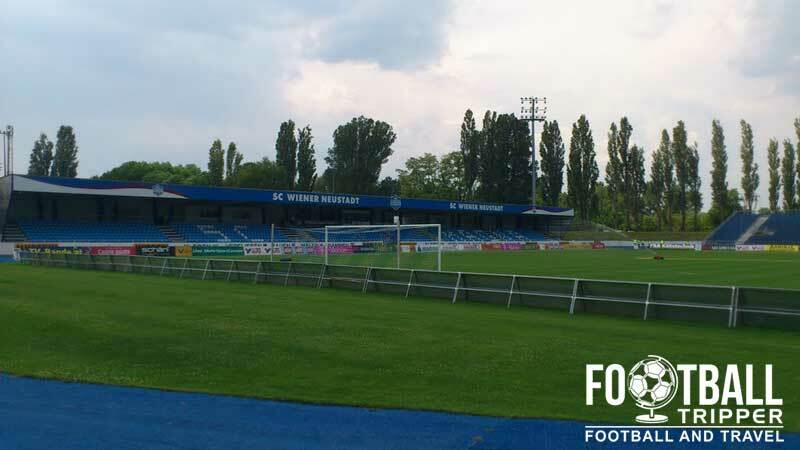 Primarily used for football matches, the 10,00 capacity ground has been home to local side SC Wiener Neustadt since 2008. Stadion Wiener Neustadt was officially declared open by Mayor Rudolf Wehrl in May 1955 after a construction period of three years with the current home team SC Wiener Neustadt being the sole tenants throughout the stadium’s history excluding one season. During the 1972-1973 season the now defunct SV Admira Wiener Neustadt from the local area also used the playing facilities. The record attendance for a match at the Stadion was set on the 14th September 1963 against Austria Wien which saw just over 12,000 fans witness the home side sneak a 1 nil victory, much to the surprise and delight of the supporters. With the capacity currently sitting at 10,000 after the most recent round of renovations which occurred in 2008, the record is unlikely to be beaten any time soon. 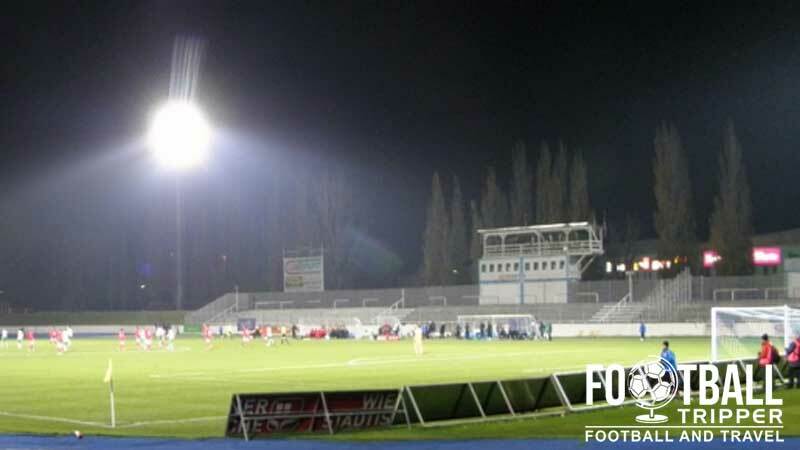 Coming in at a cost of 1.2 million euros, stands were reconfigured just in time for the 2007/2009 season and new floodlights were installed after modernisation which had occurred in the 1980s was now becoming antiquated – a fact not helped by Wiener Neustadt being relegated to the Austrian second division in 1995 which severely greatly the club’s revenues. The highest profile match the stadium has hosted to date was probably the 1965 Cup Winners Cup match against FC Universitatea Cluj, with the travelling Romanian team winning 3 nil, making the newly introduced “away goals” rule for the reason completely irrelevant. This appearance in Europe came about after defeating domestic rival LASK Linz in Austrian Cup of the previous season with the club regularly participating in the Austrian Bundesliga since the 2009/2010 season. Stadion Wiener Neustadt is comprised of the following four stands: North, East, South and West. The Fan shop at Wiener Neustadt’s ground is adjoined to the club office and along with the online store is the best place to browse and purchase official merchandise. The fan store is of course also open on matchdays for up to 90 minutes before kick-off and for 30 minutes after the full time whistle. We can’t find any evidence online which suggests that there is a tour available of Stadion Wiener Neustadt. Tickets to see SC Wiener Neustadt play at home can either be purchased online from the official website (print at home) or at the stadium on matchdays a few hours before kick-off. 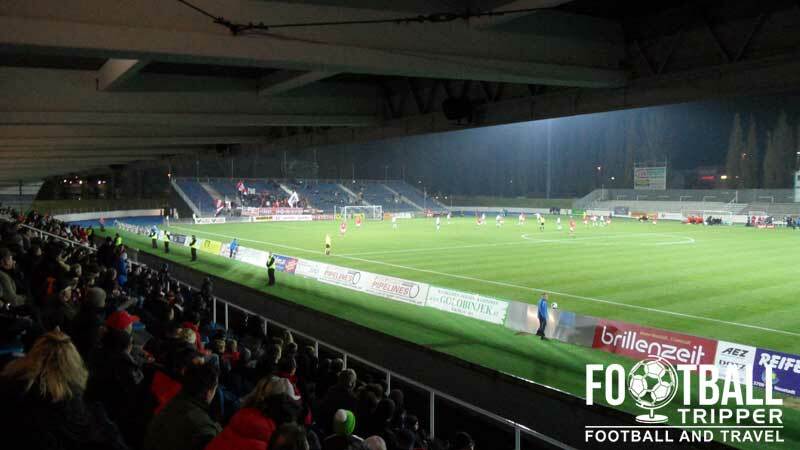 The stadium is located approximately 3.0 km north-east of Wiener Neustadt’s city centre and a similar distance from the main railway station. Subsequently the journey by foot is likely to take most Football Trippers the best part of 40 minutes – if they choose to walk that is. There is a reasonable amount of parking available at Stadion Wiener Neustadt including car parks south-east of the ground, at Merkur City Shopping centre and just behind the north stand off of Stadion Stadionstraße. The city is served by four or so train stations however none offer any locational advantages when travelling to the stadium so just stick to Wr.Neustadt Hbf which is the main railway station. Exterior to Wiener Neustadt Railway Station. The closest bus stop to the stadium is located along Wiener Strabe 1 mile or 15 minutes away. The closest major airport is Vienna International Airport which is around 70km north of Wiener Neustadt. The three star rated Hotel Zentral appears to be pretty good value when compared to Hotel Corvinus and Casa Topolino. As the name implies it’s within the city centre close to the station.